The theologian prof. mag. dr. E.C.F.A. 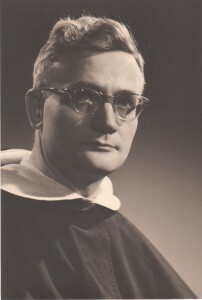 Edward Schillebeeckx (born 1914), advisor to the Dutch bishops at the Second Vatican Council in Rome (1962-1965) and at the Pastoral Council at Noordwijkerhout (1966-1970), has played and is still playing a major role in ecclesiastic and theological renewal. Through his scientific studies and applied scientific pastoral books, sermons and lectures he is able to inspire a wide reading public, not only within the Christian churches but also outside them. His enormous scientific authority, based on his erudite knowledge of the Christian tradition, is coupled with compassionate engagement with people and movements in the church and society that focus on those who are exposed to injustice and suffering. His theology centres on the human being as the image and likeness of God. 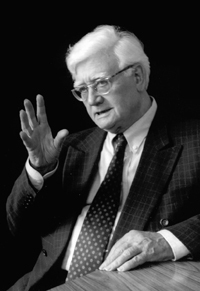 Born in Antwerp, Edward Schillebeeckx was intrigued by new problems from the outset. At an early age he evinced a keen interest in the questions of thinking people, believers who found the straitjacket of the neo-scholastic tradition too confining and had started reflecting on God, Jesus of Nazareth and the meaning of life for themselves. As far back as the 1950s and 1960s Schillebeeckx, in the situation of confrontation, wrote such influential works as “Sacramentele heilseconomie”, “Christus sacrament van de Godsontmoeting and Het huwelijk”. Many recognised him as a major innovator in the fields of theology and religious experience. Because of this Cardinal Alfrink invited him to come as an advisor to the Second Vatican Council. His concern for people prompted him to take on the flood of critical questions that was unleashed by the Second Vatican Council. He consistently stressed that God is not directly accessible as a seperate being and that human beings have to take responsibility for their own history, a responsibility that they must face up to in solidarity with others, especially the poor in their midst. This is a matter of human faith in God, for “in your own footprints you will discern the imprint of God’s love”. That is how we become aware of God, not directly but always in a mediated way. 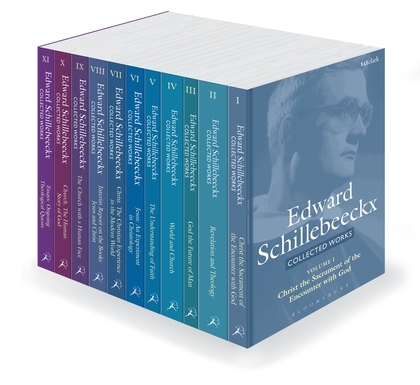 In the 1970s and 1980s Schillebeeckx published his three greatest works: Jezus, het verhaal van een levende; Christ: the Christian Experience in the Modern World (translated from the Dutch [by John Bowden]: Gerechtigheid en liefde, genade en bevrijding) and Church: the Human Story of God (translated from the Dutch [by John Bowden]: Mensen als verhaal van God), treatises on the church’s official ministry, politics and democracy, pastoral volumes and articles. These works were born of his studies of, and participation in, vital movements in the church and the world at large. These movements and developments include growing autonomy in faith and ethics, movements for democratisation, the engagement of Christians in politics and of women in the church, liberation theologies and base churches. He is also known for his critical identification and repudiation of all manner of ideologising which either legitimises established positions or obstructs new ones.